← 452 "Million Dollar Maybe"
A teller gives tarot cards to Grampa of the Simpsons. "Boy Meets Curl" is the twelfth episode of season 21. It originally aired on February 14, 2010. It guest stars Bob Costas. "Homer takes Marge out for a romantic evening of ice skating and hand-holding, but upon entering the rink, they encounter a curling team practicing. Marge and Homer take to the ice and discover their love for the sport, and soon after, join the curling team and compete with them in the Olympic trials. Team Springfield claims the win and moves on to the 2010 Vancouver Games where Bob Costas covers the action. Meanwhile, sleazy vendors introduce Lisa to the world of collecting Olympic pins, and before long, Lisa is hopelessly addicted." It's a date night for Homer and Marge Simpson but the employees of the Springfield Nuclear Power Plant are forced to stay behind and clean up a radioactive leak. This leaves Marge annoyed at Homer for being late. Homer then takes Marge to a movie but can not enjoy it because of too much noise and so go ice-skating instead. Marge and Homer wind up at a curling rink when their plans for a date night fall through. They both discover their innate talent for the sport - particularly Marge, who has years of experience sweeping floors. Agnes and Seymour Skinner invite Marge and Homer to join their team. Agnes, however, cautions Marge not to let emotions get in the way of winning, relating how a fetal kick by an unborn Seymour foiled her chances at winning gold in pole vault at the 1952 Summer Olympics in Helsinki. 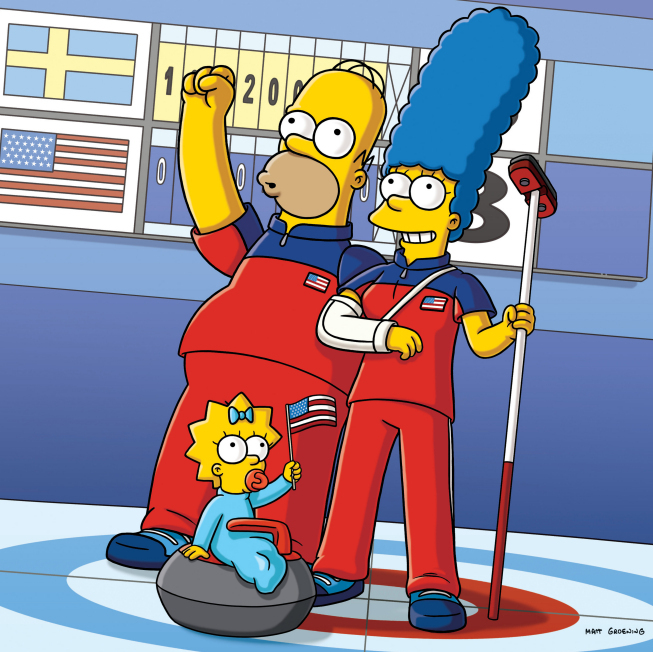 Nevertheless, the Simpson-Skinner team qualifies to compete in the demonstration sport of mixed-doubles curling at the 2010 Winter Olympics. Meanwhile, Lisa discovers she enjoys collecting Olympic mascot pins, but her interest in them quickly spirals out of control. She trades her pearl necklace to a vendor in exchange for a pin from the 1924 Winter Olympics in Chamonix, France. When Bart discovers Lisa busking on a street corner, he decides to retrieve her necklace. He tricks the pin vendor with "Fatov", a phony mascot from the 2014 Winter Olympics in Sochi, Russia; the mascot is really Homer's jowls, clipped from his driver's license. Bart gives Lisa her pearls and offers to help her kick her pin-collecting addiction. When they arrive in Vancouver they encounter the medicine woman from The Simpsons Movie. After the Ghostbusters opening ceremony (which was very tiring for the announcer) and a few games, Marge is told by Agnes that she wants Homer off the team. Marge insists she can compensate for his weak throws, but injures her right shoulder while sweeping rigorously to restart Homer's stone. She is told that she will never curl again and that the American curling team must concede defeat to Sweden. After Marge reveals a big secret that she is left-handed, she used her right hand so people wouldn't think of her differently, and by sweeping with her left arm, leads her team to victory and the gold medal, the first and only medal won by the USA in the Olympics. In the end, she and Homer agree that they had a great date night. The writers wanted an episode about Olympic sports that could air during the 2010 Winter Olympics in Vancouver. 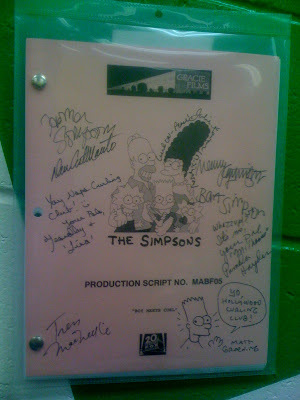 Curling was chosen because they thought it would allow for the plot to be about Homer and Marge. Although curling is an Olympic sport, mixed-doubles, which is featured in the episode, is not an Olympic event, so the writer had to use some artistic license. The writers visited a curling club and tried the sport themselves in order to make the depiction of the sport accurate. "Boy Meets Curl" was viewed by 5.87 million viewers and got a Nielsen rating of 2.6 in its original broadcast. It received positive reviews from critics and was enjoyed by curlers. ↑ 1.0 1.1 Golen, Jimmy (2010-01-11). Stronger, Higher, Homer? 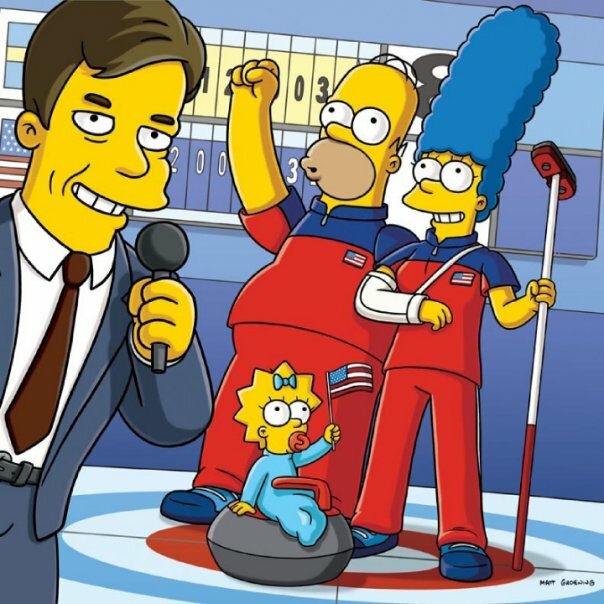 Simpsons go curling. CTV Olympics. Retrieved on 2010-01-25. Modified on July 22, 2016, at 03:06.